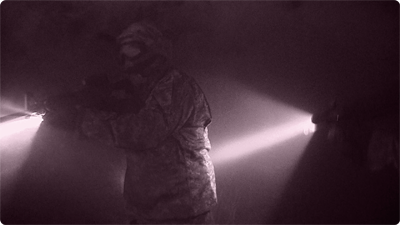 The Tachyon OPS HD Night Vision camera is designed to film in the dark and in extreme low-light situations such as those encountered by police, SWAT, special forces, border control, and hunting. The OPS HD Night Vision can record in daylight, although with reduced color saturation.The Tachyon OPS HD Night Vision also works as a surveillance camera for the home or business. It boasts a 125 degree field of vision and works with both the visible 850nm and the invisible 940nm infrared light sources. It has infinite recording loop technology with which it will begin to record over old footage after it fills its memory of up to 32GB. The OPS HD Night Vision has a time-lapse photo mode that takes 1 photo every 2 seconds. Each photo is time and date stamped, which comes in very useful when using the camera for surveillance. 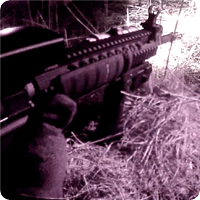 Like all Tachyon cameras, the OPS HD Night Vision couldn’t be easier to use. It is ready to go right out of the box and has a simple, one-button operation. For stealth considerations, it is set to make no sound when turning on and off. At the back of the camera is a small, dim LED to let you know when it is turned on. The cameras are also plug-and-play with a PC or a Mac. Optional accessories include a cable for plugging into a 110v and 12v outlets and external chargers for continuous charging and recording. Another is a water-resistant, silicon rubber cover which makes the camera weatherproof, a great benefit for outdoor monitoring and activities. The OPS HD Night Vision is the same size and weight as the current OPS HD camera (1.2 OZ, 2.9 X 1 X 1 Inches) It also boast the same patented 8-way mounting system that gives the user an unparalleled range of mounting positions, where the user can rotate the camera inside it’s mounts from the 12 to the 9 to the 6 to the 3 o’clock positions. Standard mounts that come with the camera include the contour mount, for mounting to curved surfaces such as the side or tops of helmets. A standard tripod mount that will attach to any ¼-20 inch universal tripod screw. And a clip mount, with multiple angles of rotation, that is perfect for caps and straps and collars. 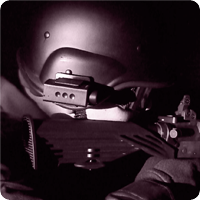 The OPS HD Night Vision can also be mounted to many different types of guns using our optional zinc-alloy GunCam mounts. Guns such as pistols, shotguns, bolt-action, auto, and semi-automatic rifles (and their scopes), paintball markers and airsoft guns are all covered. No modification is necessary to your guns. The OPS HD Night Vision cameras can record over four hours of video on a single charge. Time-lapse photos can be recorded for twice as long. The camera uses a built-in Lithium rechargeable battery that is perfect for filming in extreme temperatures. This built-in battery, tightly enclosed inside the case, prevents loss of footage due to shock or dropping the camera. Keep an eye out this spring for Tachyon’s invisible 940nm infrared light that will include many of the same mounting options, for helmet, gun rail, cap, and tripod, as the OPS HD Night Vision Camera. The OPS HD Night Vision camera will sell for $139.99. Lewisville, TX based Tachyon(TM) Inc., is the premier innovator of durable, extreme helmet cameras. The Tachyon camera’s ease-of-use, durability, recording time and quality, make Tachyon the trusted and go-to helmet camera source for people who engage in a wide-range of extreme activities.